My poster for Penny’s talk with images of Augustus’ genius and students engaged in the survey outside Game. 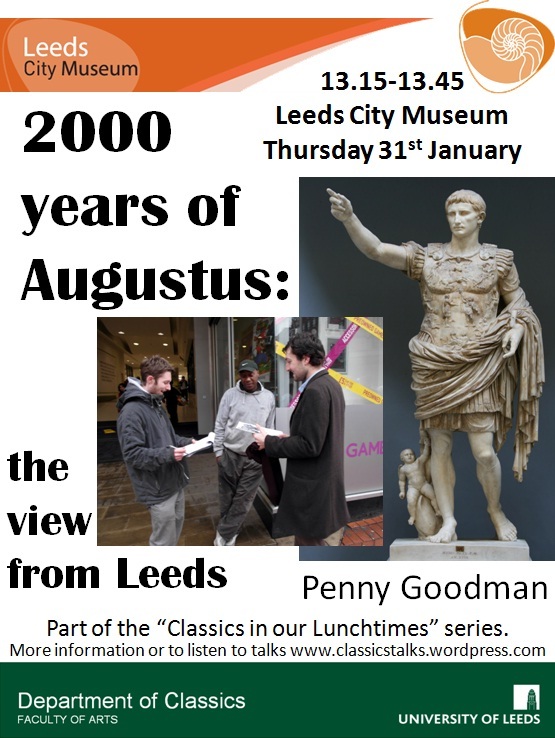 Penny Goodman, presents some results from a survey her students conducted in Leeds about Gaius Julius Caesar Octavianus, better known as Augustus. Augustus had a keen eye to image manipulation and may be surprised by what people know, or think they know, about him 2,000 years later. The talk will provide a fascinating insight into perceptions of the classical world, particularly ancient history, today. Penny is a researcher, blogger and Doctor Who enthusiast. She is the author of a recent article on Augustus on screen, and has recently appeared on Leeds Radio.